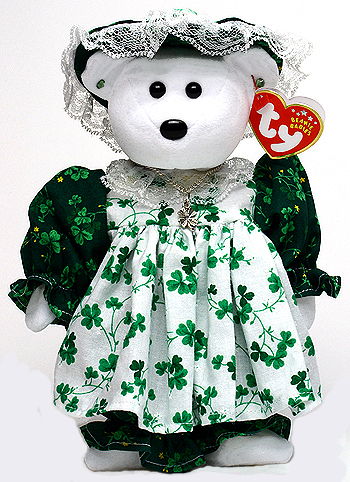 from Galion, Ohio, is the winner of this year's Saint Patrick's Day Beanie Baby contest. The publishers of Ty Collector send their warmest congratulations to Tina, along with the first place prize of $100. 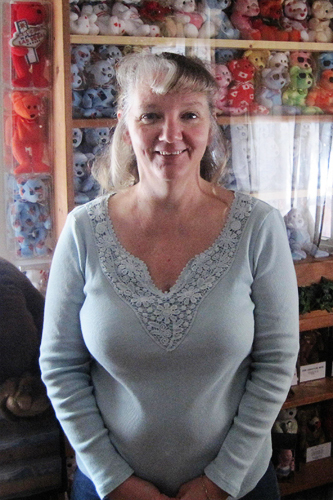 Tina has been an avid Ty collector for many years, specializing in Beanie Baby Bears, collector cards and key-clips. She recently added the Ty Erasers, Boos and Beanie Ballz to her list of "must-haves." Tina is a homemaker who admits to having "baking abilities." People who know her would say "baking abilities" is an understatement. As a matter of fact, Tina spends so much time baking her special cakes and cookies for a long list of friends and clients that we're amazed she can find any spare time to collect Beanie Babies. Tina plans to start a small business in the future named Cakes & Cookies by Tina. The entry period for this contest has ended. The winner was announced on January 17, 2012. 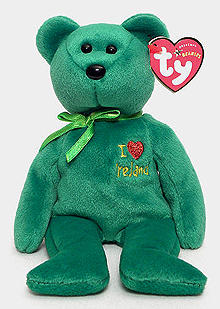 Ty did not introduce a new Saint Patrick's Day Beanie Baby in 2011. Maybe he was just too busy working on the new Beanie Ballz animals. 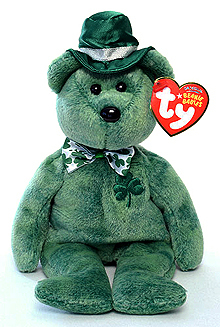 Lets give Ty even more time to work on new product lines by creating our own Saint Patrick's Day Beanie Babies for 2012. 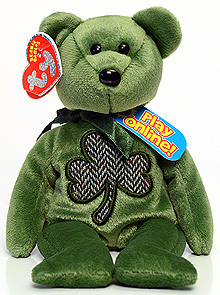 Tycollector.com's first ever contest features a cash prize of $100 for the best original Saint Patrick's Day Beanie Baby created from a pre-existing Ty Beanie Baby. If 16 or more entries are received, a 2nd place prize of $50 will be awarded. If 30 or more entries are received, a 3rd place winner will receive $25. Winning entries and their creators will be featured at tycollector.com. The contest entry period runs from September 15 thru December 15, 2011. No entries will be accepted after December 15, 2011. 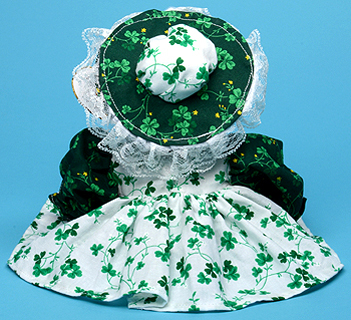 Your entry must have a Saint Patrick's Day theme and be created using an authentic Ty Beanie Baby (or Beanie Baby 2.0). The Beanie Baby does not have to be a bear. Any Ty Beanie Baby may be used. No Buddies, Classics, Boos, Ballz or other product lines will be accepted. 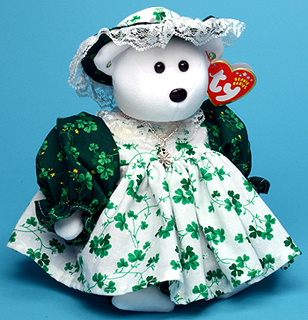 The Beanie Baby used to create your entry may NOT be a pre-existing Ty Beanie Baby that already has an "Irish" or Saint Patrick's Day theme. Entries may be custom dressed, painted, posed and accessorized. To prevent licensing and copyright issues, entries may NOT be created using licensed characters like Dora, SpongeBob, Hello Kitty, Garfield, etc. There is no entry fee and only one entry per individual is allowed. The contest is open to collectors from any country. There is no age restriction. Employees of Ty Inc., Webstatic Enterprises, Inc., Iriswhite Publishing and Heartegrity are ineligible to participate in the contest except as invited judges. The official entry date and time is determined by the "sent" date and time in the header of the email. Contest entry photographs must be emailed by contestants not later than midnight, US Pacific time zone, December 15, 2011. Contest winners will be notified by email and then required to mail their original Beanie Baby creation to Ty Collector so it can be photographed. Ty Collector will return the winning entries and pay for the postage both ways. Winners who decline to send their winning entry to the address provided at that time will forfeit their prize. New winners will not be substituted. Judging begins on January 5, 2012. Winners will be notified prior to January 31, 2012. Prize checks (payable in US dollars) will be sent to the winners with the returned winning entries (after the entries have been photographed). Payment of federal or state taxes (if any are required) on the winnings are the sole responsibility of the winners. Ty Collector reserves the exclusive right at the sole discretion of its publishers to post photographs of any or all entries and the winners, at the Ty Collector Internet site. Contest entries will be judged by Sondra Schlossberg, Leon Schlossberg and two additional Beanie Baby aficionados. Decisions of the judges are final. Ties in judge scores for the winners will be resolved by Sondra Schlossberg. These rules may be modified at any time to conform to state and federal laws and statutes governing these types of contests. This contest is not affiliated with or endorsed by Ty Inc. Rule changes will be posted on this page as/if they are made.